“Prevention of domestic violence – strategy and action plan” – this was a topic of the joint civil forum arranged by Fund of Women Entrepreneurs and Fund “Sukhumi” in Kutaisi. The invited guests represented local government structures, mass-media, civil scoiety, lawyersn psychologists and women entrepreneurs. The beneficiaries of Fund of Women Entrepreneurs presented their production, inclunding confectionery, family farming products and etc. The forum participants attracted attention to discussing the reasons and ways of solution the problem of domestic violence. There was highlighted, that one of the factors of increased facts of violence is hard socio-economic conditions in the society. One of the means of fighting against this problem is to support development of small business. Women entrepreneurs, in the group work presentation, considered the ways out directed on encouraging the economic growth. At the completion, the stratedic directions and the action plan was elaborated to be considered in further activities. Fund of Women Entrepreneurs was visited by the representatives of the donor organization EED: Ilonka Boltze (Program Officer in Balkans and Caucasus), Michael Kronenberg (senior manager of financial instruments), Levan Abashidze (Consultant in Georgia). The aim of the visit was to get acquainted with the Fund’s activities and future plans and monitoring of work places. At the end of the day, the guests evaluated the work and made recommendations to the Fund. On August 31, Fund of Women Entrepreneurs organized a round table discussion on “Social Entrepreneurship – New Challenges and Prospects.” Among the participants there were the employees of the Fund and beneficiaries, as well as the chairperson of Fund “Sukhumi” – Alla Gamakharia and the representative of the Swedish women’s international organization KVINNA TILL KVINNA – Marie Wirde. The roundtable participants discussed the topic of social entrepreneurship as a new trend in business, the mobilization of the community and search for funding sources. The guest from Sweden spoke about the example her country that the State necessarily must develop mechanisms to support women’s small businesses. 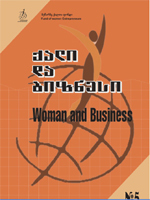 The seventh issue of the journal “Women in Business” was issued in an updated design and format. Readers will be provided with the information about the thematic rubrics on the activities of Fund of Women Entrepreneurs Forum. The rubric “various” reflects the work, undertaken by the organization during last three months. The “Perspectives” covers the evaluation process and the results of Fund’s three-year work, implemented by the international and local evaluators. The rubrics “we teach” and “novelty” is about the educational activities. As for the “successful stories” and “winners” tells about the women, whose business have been developed through the support of Fund of Women Entrepreneurs. The first article in the newsletter is devoted to the visit of the representatives of the donor organization EED: Ilonka Boltze (Program Officer in Balkans and Caucasus), Michael Kronenberg (senior manager of financial instruments), Levan Abashidze (Consultant in Georgia). 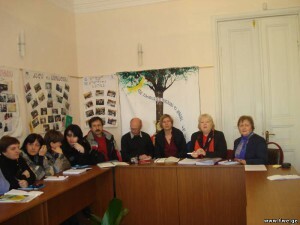 The guests visited two work places in Kutaisi as well. 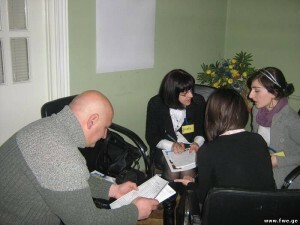 The other articles cover the information on: work places created within the project of FWE, the civil forum on the topic “Domestic violence – strategy and action plan”, the international conference in Vilnius, a new initiative of FEW to support women – “School for women – administrative management and business ethics”. As usual, the lawyer provides the interesting information for the beginner entrepreneurs. An interesting discussion around this topic was held with active participation of the Georgian Young Lawyers’ Association Kutaisi Branch Manager, the successful women entrepreneurs and business training participants. There was reviewed the Fund’s activities, achievements and the importance of women’s small business development and expressed the opinion that the establishment of a person as a businessman depends on personal qualities. The changes in the tax code have shown that the space is quite stimulating business development, and the more liberal is state policy, the more honest should be entrepreneurs. Fund of Women Entrepreneurs conducted a four-day training on social entrepreneurship in Kopitnari with participation of fifteen women. The thematic included the following issues – role of social entrepreneurship in progressive development of enterprise, planning of entrepreneurship schedule: mission, vision and strategy, SWOT analysis, marketing, initial budget and forecasting of incomes. In the course of the training, there were discussed key factors for success, right planning and project elaboration procedures. Four groups designed their projects within the same area. Their idea focused on establishment of the mini social enterprise of sour-cream and cottage cheese. Fund of Women Entrepreneurs organized a three-day workshop on the topic “Outcome and impact oriented planning, monitoring and evaluation. The seminar was rendered by a specially invited free lance consultant and trainer from Germany – Andrea Quiroz de Souza. 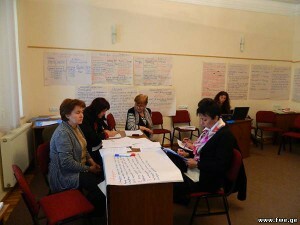 The experienced facilitator shared her experience and gave valuable advice to the staff of Fund of Women Entrepreneurs and the Fund “Sukhumi” on such issues as elaboration of logical framework, proper identification of outcomes and indicators, purposeful application of monitoring and evaluation mechanisms. Particularly important for the participants was the detailed information about the new requirements of the donor organization EED, which places special emphasis on the outcome and impact oriented work of partner organizations. 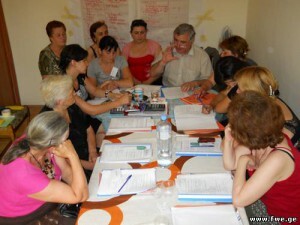 From June 20 to July 1, the work of Fund of Women Entrepreneurs within a three-year project, financed by EED, was evaluated by the international and national evaluators – Ralf Lange (Germany) and Nino Tvaltvadze (Georgia). As the project ends at the end of 2011, the evaluation results and recommendations will be a kind of guide in the process of development a new project proposal and in reviewing the future work. The evaluation was meant to assess the project 2009-2011 in accordance with the evaluation criteria – relevance, effectiveness, impact, efficiency and sustainability. As well as to provide information and recommendations based on the obtained data. For assessment of project effectiveness and impacts it is proposed to apply a participatory impact assessment method called MAPP, which is using interactive tools such as a life curve of beneficiaries and trend analysis for identification of gross impacts and a influence matrix for rating of net impacts. Project relevance, findings and recommendations of the Fund’s activities – for women entrepreneurship development, vocational training and public relations, sustainable (expenditure sustainable, planning, monitoring and evaluation), the total impact, sustainability. The final evaluation report is in the process of elaboration and after it is submitted, Fund of Women Entrepreneurs is ready to introduce the recommendations to the beneficiaries in order to jointly plan future cooperation in the development of important trends. The representative of Fund of Women Entrepreneurs, Diana Kurashvili participated in four-day training on “diversity management”, organized by the financial support “Open Society – Georgia”, within the project on capacity development of civil society organizations. The thematic was very interesting, including the issues as diversity management, correct ways of solving problems, how to make the diversity the basic resources. After discussions on each issue the group works were carried out, that made the seminar even more effective. Fund of Women Entrepreneurs was represented at the workshop on March 21-25, organized by EED for the partners – “Outcome and Impact Oriented PME”. The workshop participants from the non-governmental organizations of Georgia and Armenia obtained the knowledge of the issues such as results-based management, the results chain and its relation logical framework, EED requirements and new reporting format, baseline data and indicators definition. Similar seminar will be planned for the Fund’s staff in order to share with the important experience. The school “Office management and business ethics” was aimed at enhancing skills and knowledge of middle-aged women to facilitate their further employment. Eight middle-aged women finished the school. All of them were unemployed with higher education. The programme covered computer, English, accounting and office management courses. 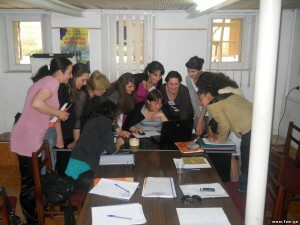 In September, two trainings were conducted on the theme “Small Business Basics”, in Poti and Kutaisi. The participants included both IDPs and local women who were actively involved in the training course. They were given the opportunity to reveal their capabilities and the obtained knowledge in the presented exemplary projects at the end of the training, reflecting the strategy of achieving the goals. The participants have realized that the proper use of existing resources plays important role in running small businesses successfully. On August 23-26, a regular business-training was held, which was attended by 14 women, among whom there were two women from Abkhazia – Tkvarcheli and Agubedia. Of particular interest among the participants raised a topic related to the activities of small businesses: a technique preparing a business-plan, organizational plan for the project, the cash flow sheet, review of their business-ideas.The presentations were made of the business-plans in the service sector and trade. After the training, the participants, for three days, were given opportunity to get advice on preparing a business-plans. Ten participants of the training are prepared to present their projects for the tender. On July 19-22, Fund of Women Entrepreneurs held a regular training on the basics of small business in Zestaponi – the settlement of Kvaliti. Fifteen participants of the training got acquainted with the issues of entrepreneurship, have been thoroughly explored the marketing strategies and market research, tax law and legal aspects of business, the principles of preparing a business-plan. In the process of group works on elaboration of business-projects there was identified the participants’ interest in service provision sector and family farming (apiculture or beekeeping). 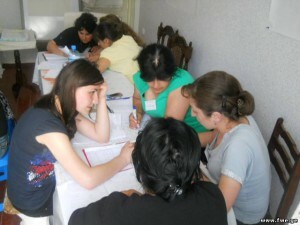 On May 17-25, there was conducted a training on the basis of small business. It differed from previous ones in that the integrated group joined both IDP and local youth. From the very beginning, the participants expressed the interest on each issue, as well as actively participated in discussions and in the practical tasks. 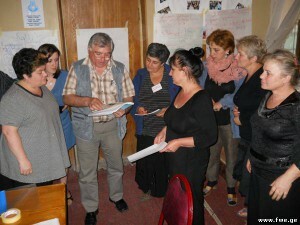 On the last day of training, the participants developed interesting business-plans in the groups. The ideas presented, mainly related to the service sector. After a week of consultations, each participant has an opportunity to present their business-projects to the competition committee and in case of approval, new work places will be created. Fund of Women Entrepreneurs organized the next training with participation of fifteen women IDPs and locals. The thematic remains the same: women’s leadership, legal aspects of entrepreneurship, Tax Code of Georgia, the principles of developing business-plan, marketing and strategy of market research. The group members, women of different age, were mostly active during the practical tasks. 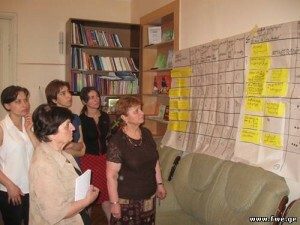 At the completion, the women expressed very interesting ideas. They intend to submit business-projects to the competition commission.